An historic milestone in aesthetics. 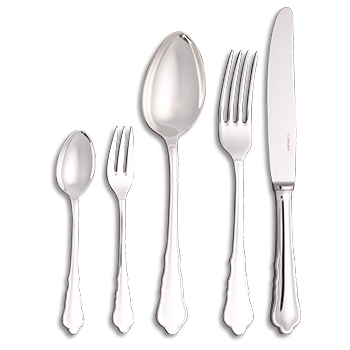 Made using high-grade materials and featuring an unusual design, Menuett epitomises classic, ever-fashionable tableware. The distinctive handle and classy design in particular are reminiscent of days gone by and hint at the baroque style. High-quality alpacca silver, fine finishing and numerous distinctive details give Menuett a unique, sophisticated flair. Sensual cutlery for making magical dreams come true.